When you add a front roll cage to your Early Bronco your glovebox door is blocked by the roll cage and the glovebox becomes useless. The way to fix this is to modify the hinge so the door can be slid over to clear the rollcage. 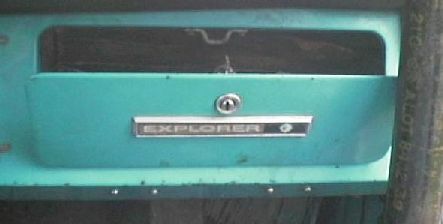 Start by removing the 4 screws on the bottom of the dash. You may need to get to other side to hold the nuts while removing the screws. Once you have it loose, you can unscrew the 4 screws holding the hinges to the door. Use a hacksaw to cut the rod in the hinges and remove it. The springs can also be removed, they will not be reused. Cut off the left side hinge pivot from the upper hinges according to the diagram below. 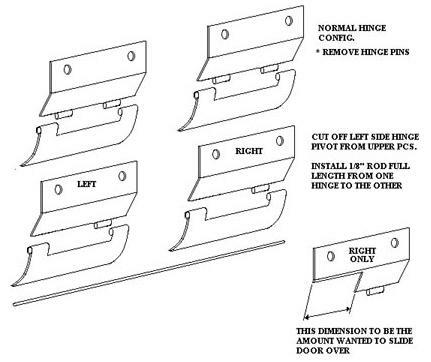 In order for the hinge to clear a part of the dashboard, a notch must be cut out of the right upper hinge (see diagram). I needed to be able to slide my door over a little more, so I also cut out most of the other hinge pivot in the upper hinge (see pictures below). Once you have done all your trimming, it's time to put things back togather. A single rod will replace to two hinge pins you cut out. I found that a threaded rod about 1/8" fit tightly in the lower half of the hinge, but fit loose in the upper part of the hinge and would let it slide back and forth. With the upper hinges attached to the door and the lower hinges held in place by hand, I twisted the threaded rod into place and cut the extra off. I found it held strong enough that it doesn't need anything to secure the ends. Bolt the lower hinges back into place and you're finished. The door can now be popped open, slid over and lowered and clear the roll cage.